In today’s markets, value has been tough to find compared to 21 months ago during Sep. 2013 when the pickings were a lot more richer. However, the astute investor does not have to own the markets, he only needs to find one or two investments that have sufficient margin of safety at any given point of time to create value over the long run. Traditionally, we have always been a bottoms up investor. While we will continue to make investments bottoms up, we are okay to see if we can identify points of dislocation in the markets by looking top down as well. Today, there are three points of divergence that we can identify with the markets in general. The performance of real estate stocks, the price of oil going down and price of gold over the last decade. Before we go further, I must confess my view has been and still is that real estate, oil and gold are all commodities. They do not produce any cash flows on their own (small returns for leasing of gold and real estate) except on their sale. Their market value can be perceived to be the opportunity cost of the buyer. From that point of view, one can make an argument whether it is a real asset or not. However, it has been my observation that one can construct business models around commodities that have the ability to create values like housing lending companies, jewellery businesses, real estate construction and REITs. Today, we will focus on the real estate business. There are three ways an astute investor can participate in the real estate business. Own real estate (land or flats), lend to the real estate sector or own real estate lending companies and owning real estate construction companies. We will talk briefly into all the the three but our primary purpose is to look at option 3 and explore it further in subsequent posts over the next few weeks. a. Option One — Owning Real Estate — Traditionally preferred by a lot of investors. One feels secure with a roof on the top of one’s head and society does seem to value individuals owning real estate higher than those who don’t (it is an Indian thing). In key cities, rental yields annually are around 2-3% of the purchase cost of the real estate (assuming we have a construction ready real estate) Even if one were living in our own real estate, it does bring costs down by 2-3% of rental costs per year. Also, after tax breaks, it is possible to borrow at 6% and invest in real estate. It is easy to lever and banks are more willing to lend against the brick and motor assets. However, for the small average investor, it does quickly balloons into a big portion of their assets and entrench them that will prevent the investor from exploring alternate more lucrative investments. Secondly, the unlevered returns from the real estate sector is not alluring as it is after leverage. Several studies indicate that most of the real estate returns come through leverage. It must be noted, that if one does intend to lever up, real estate is probably one of the safer ways to lever one’s equity. Thirdly, liquidity and transaction costs of buying and selling means that it is not always possible to move equity to a more lucrative long term investment without costs and time. Fourthly, there is an ongoing maintenance costs that is needed to maintain real estate. Lastly, getting the right certificates, permits, clean documents are always a hassle in the corruption ridden system. b. Option two — lend to real estate or own housing lending companies — directly lending to real estate transactions can be perilous without the right systems and processes. Owning housing lending companies might be a better option. Quality of the books and management are always a worry here. There are companies like Gruh finance (terribly expensive) have done this successfully creating a viable business model around real estate. Some banks and NBFC’s are also heavily reliant on housing finance. There are two catches here, the good ones are already very expensive and they too depend on leverage to deliver the returns. Leverage is great on the way up and terrible on the way down. However, an average investor can have non-recourse leverage on his balance sheet by owing common equities of housing lending companies at the right prices. We will leave the exploration of this option to a later date. c. Option three — own real estate construction companies — just thinking about this sector brings about a bucket full or risks. Corruption to get permits, murky land deals, bad leverage on the balance sheets, shady managements, intense competition, deals that rip the eye balls of customers etc. the bucket keeps filling up. 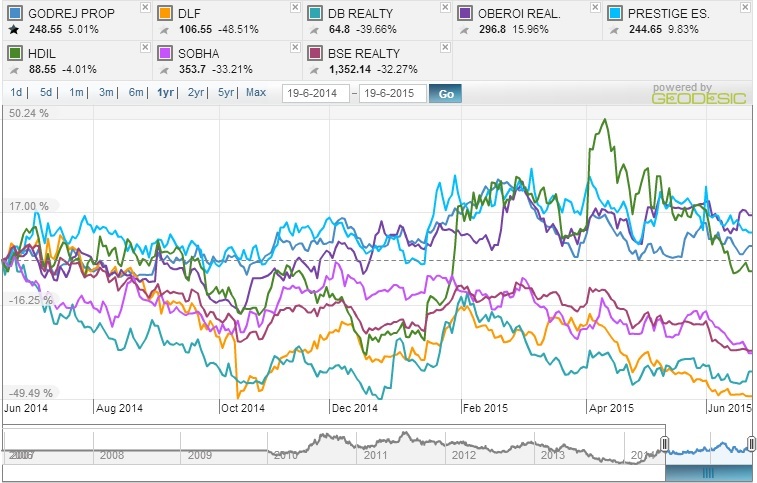 The real estate index has returned (32)%, (16)% and (64)% in the last 1, 2 and 5 year horizon. It is this big negative numbers that caught our attention. When a sector is this beaten down, the chances are it has also influenced some of the good companies to some extent as well. We do want to wade through this sewer to see if there are any good bets that might work out in the long run. 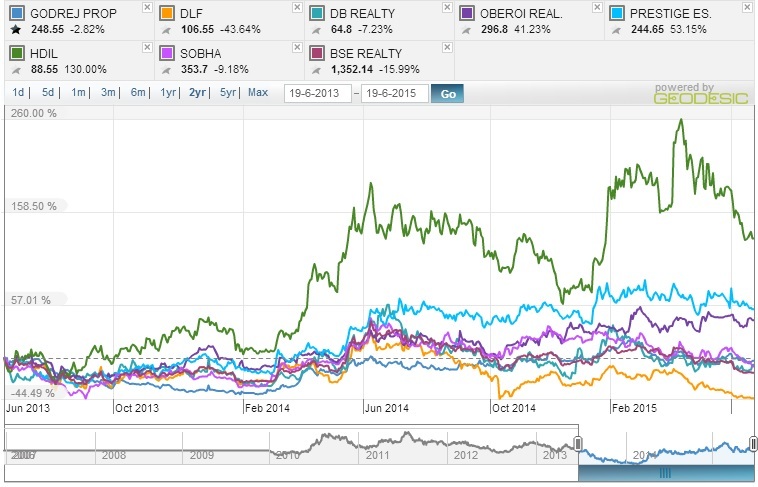 Below are the charts that show the performance of the bigger real estate companies and the index over these horizons. Over the next few weeks, we will be working on publishing a series of posts looking at the risks of investing here and also into the individual companies. 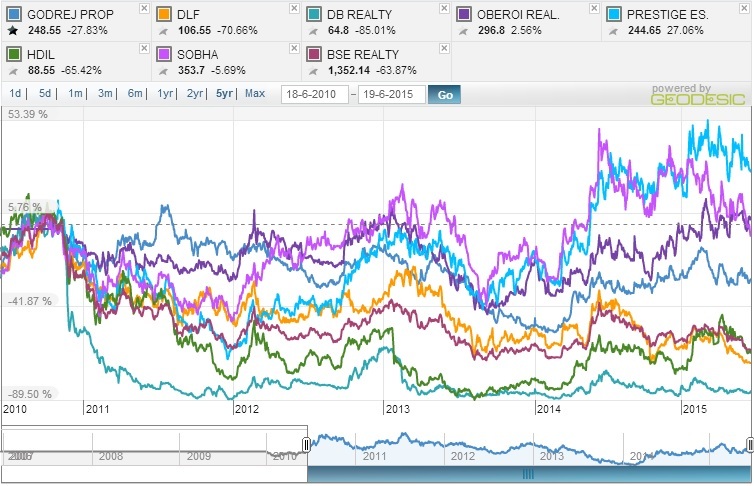 If one closely looks at the five year performance of the real estate companies, hardly any value has been created. Investors have been carrying return free risk for 5 years adjusted for inflation. Not a single company has been able to create value as compared to fixed deposits as well over the same time frame. Prestige estates has been one of the better ones (we have not included Ashiana housing that we own as we think it is an outlier) with 27% return over 5 years. We will be looking into some of these companies over the next few posts. What we are looking for is for no debt to very conservative debt, no dilution, robust business models and good managements. If we do not get these characteristics, we will pass on the sector. However, we do intend to pass on companies like DLF, DB Realty and HDIL where a very cursory question rises more questions than answers.